Set in the heart of the Kingsbridge Estuary in Devon, inside a beautiful victorian building and enjoying waterside views, the Tidal Gallery is an art gallery displaying an ever evolving collection of quality art works created by well known artists from Devon, the South West of England and further afield. We work very closely with our artists to bring you a uniquely curated selection of contemporary art in a variety of media, including works by both established and upcoming artists alike, with a common denominator: style, quality and originality. See the full range of work and up to date catalogue on the artists section of this website. We are a small independent business and we pride ourselves on the relationships we have established with our artists, prioritising a good working relationship to help them thrive and to bring their best works to you. In this website you will find extensive information about who we are, what we do, and who we work with. But if you have any further questions, don't hesitate to ask. We believe in our artists and enjoy their work so much that we can't stop singing praise! That is why their art hangs on our walls, because we truly believe in what they do and we hope you will too. Whether a print off our browser, your own work or photograph, or even that treasured piece of Artwork you have been meaning to frame for a while... we have framing solutions for every budget! We offer a range of mouldings and mounts, and we are proud to specialised in recycled frames. They are affordable and friendly with the environment, come in and ask us for a quote! But before choosing a frame, why not start by chosing your art piece? Browse the full selection of originals and prints available by all our current artists through the link above. 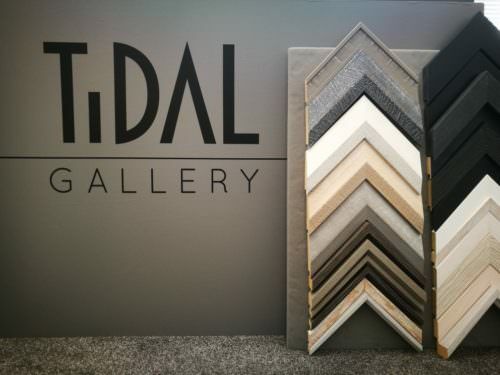 At the Tidal Gallery we truly love our surroundings. That includes beautiful Devon, the UK and our planet; and we want them to retain their beauty for generations to come. That is why we are setting up our business with a clear environmentally friendly approach. We have done our research and sourced card and paper products in different formats to do the packaging job perfectly instead of using plastics. We will also encourage the use of reusables wherever possible with the use of tailor made and long lasting fabric art carriers or by giving another use to already existing packaging. LOOKING TO SUBMIT WORK TO US? To ensure we provide excellent service to our artists, we keep the numbers small, only inviting artists to work with us when the opportunity arises. However, we welcome artists to submit work to us via email, we will be happy to provide feedback and keep your details for future exhibitions and launches if we think your work is the right fit for our gallery.